Expertly crafted Cincinnati Bearcats tag necklaces featuring fine detailing and a hand enameled finish with chrome accents. 26 inch ball chain. Use this attractive clip magnet to hold memos, photos or appointment cards on the fridge or take it down keep use it to clip bags shut. 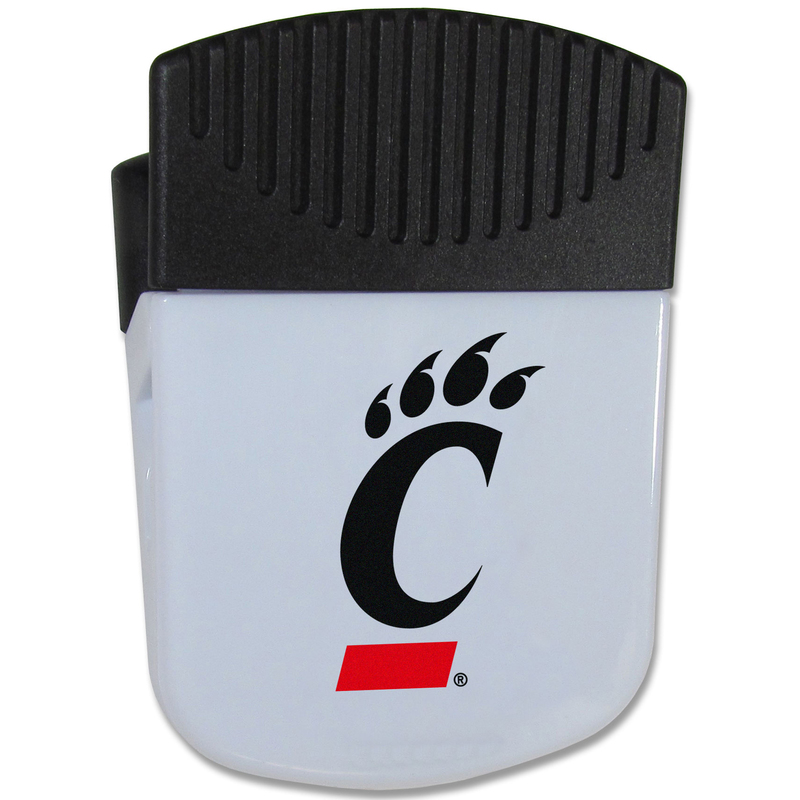 The magnet features a domed Cincinnati Bearcats logo. Every woman has her favorite pair of earrings. Why not make our most popular earrings every woman’s favorite earrings. Our officially licensed Cincinnati Bearcats zinc dangle earrings are beautifully detailed with hand colored enamel team logos that define these classic dangle earrings. They add the perfect touch of spirit to any game day or every day outfit. The earrings have a high polish nickel free chrome finish and hypoallergenic fishhook posts. 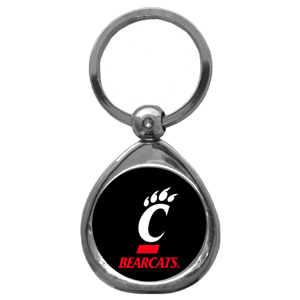 Hate searching for a bottle opener, get our Cincinnati Bearcats bottle opener key chain and never have to search again! The high polish key chain features a bright team emblem. 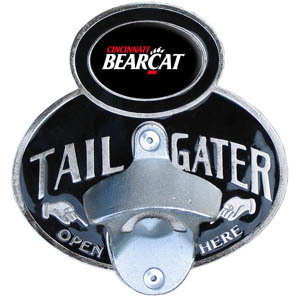 Quality detail and sturdy functionality highlight this great tailgater buckle that features an inset domed emblem Cincinnati Bearcats dome logo and functional bottle opener. Seriously, these sunglasses open bottles! 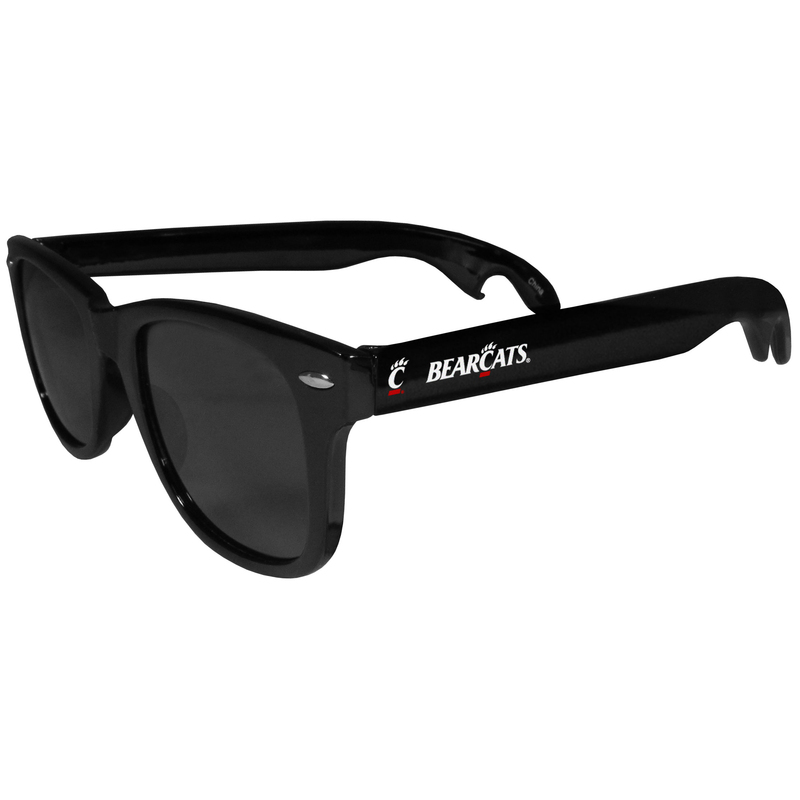 Keep the party going with these amazing Cincinnati Bearcats bottle opener sunglasses. The stylish retro frames feature team designs on the arms and functional bottle openers on the end of the arms. Whether you are at the beach or having a backyard BBQ on game day, these shades will keep your eyes protected with 100% UVA/UVB protection and keep you hydrated with the handy bottle opener arms. Use this attractive clip magnet to hold memos, photos or appointment cards on the fridge or take it down keep use it to clip bags shut. The magnet features a silk screened Cincinnati Bearcats logo. We have combined the wildly popular Euro style beads with your favorite team to create our Cincinnati Bearcats bead necklace. The 18 inch snake chain features 4 Euro beads with enameled team colors and rhinestone accents with a high polish, nickel free charm and rhinestone charm. Perfect way to show off your team pride. It's a home state decal with a sporty twist! 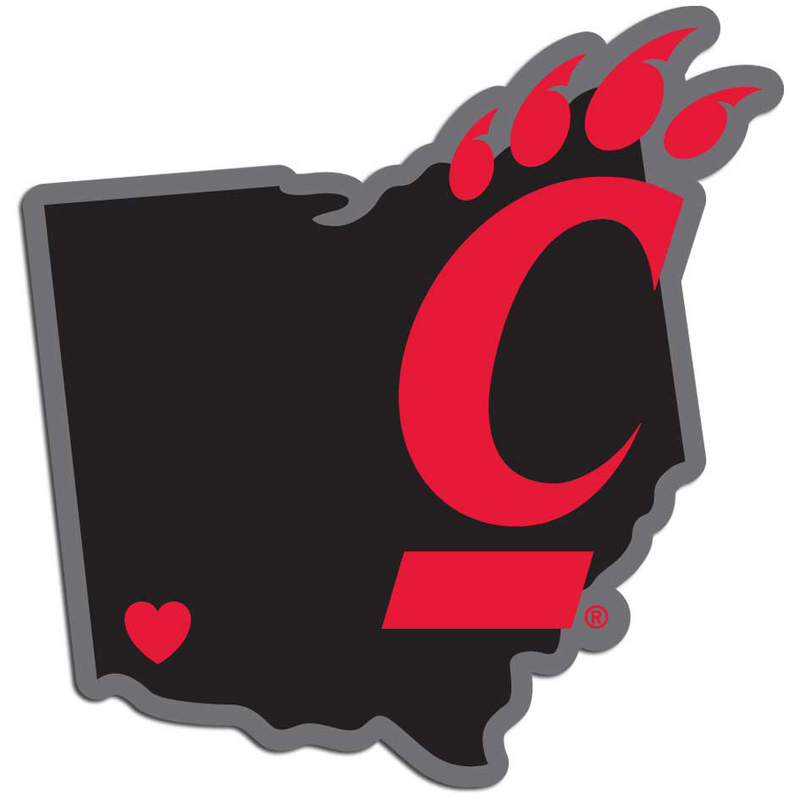 This Cincinnati Bearcats decal feature the team logo over a silhouette of the state in team colors and a heart marking the home of the team. The decal is approximately 5 inches on repositionable vinyl. Our wrist strap lanyard key chain is made of durable and comfortable woven material and is a not only a great key chain but an easy way to keep track of your keys. 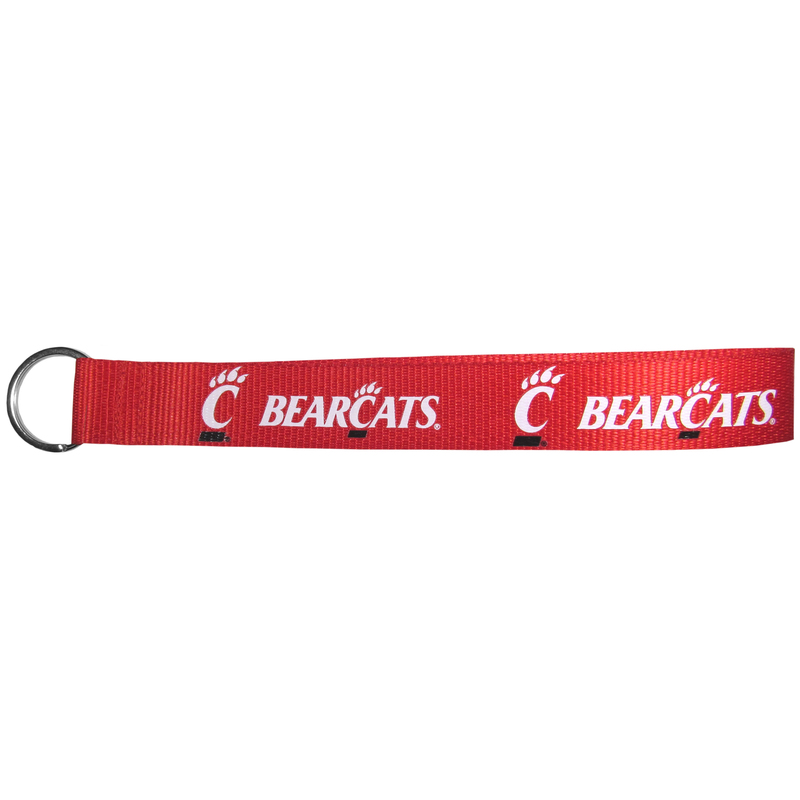 The bright Cincinnati Bearcats graffics makes this key chain easy to find in gym bags, purses and in the dreaded couch cushions.